Dr. Hayden Kho's mother, Irene Kho (main photo), filed a counter-affidavit to Katrina Halili's (inset) libel case today, July 9, at the Quezon City Prosecutor's office. She argued that her alleged libelous statements were just to defend her son and her family. Irene Kho filed her counter-affidavit to Katrina Halili's libel case against her at the Quezon City Prosecutor's Office this morning, July 9. Mrs. Kho was accompanied by her son, Dr. Hayden Kho. 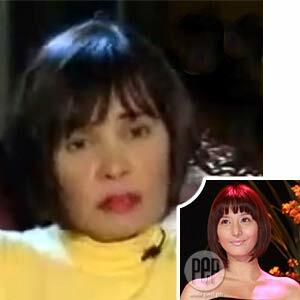 The counter-affidavit is in response to Katrina's complaint about the previous statement of Mrs. Kho, who accused the actress as the one who introduced prohibited drugs to her son. Mrs. Kho made her statement after Hayden admitted in public that he was under the influence of prohibited drugs when he videotaped his sexual encounters with different women, including Katrina. In her exclusive interview on TV Patrol last May 25, Mrs. Kho said, "Ms. Katrina, ikaw ang naglulon sa anak ko sa droga. Alam din namin 'yan at sinabi na namin 'yan sa lawyer." In her counter-affidavit, Mrs. Kho argued that the information about the drug issue was relayed to her by Hayden himself when he confessed everything to their family. Mrs. Kho also justified her statements by saying that she was just defending her son and her family from the false accusations of Katrina's camp. She added that she couldn't just ignore this move when she knew that it was planned by the young actress' publicist, showbiz talk show host and talent manager Lolit Solis. In a separate interview with Katrina Halili's legal counsel, Atty. Raymund Palad, he reiterated that there was clear malice in Mrs. Kho's statement.